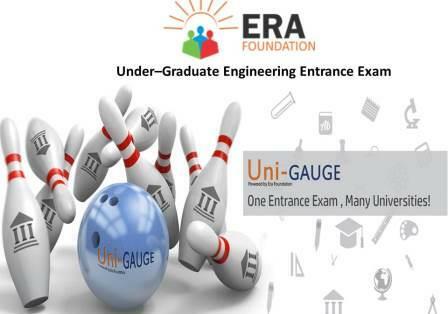 Uni-GAUGE-E 2018 ( Under–Graduate Engineering Entrance Exam ) powered by Era Foundation is All India Entrance Exam for Engineering BE/B.Tech Courses. Uni-GAUGE-E 2018 Online Entrance Exam for Engineering provides an opportunity for 12th standard/PUC students aspiring to have admissions in the best engineering institutions and universities across India. Uni-GAUGE Entrance Exam in Test Centers in 150+ Cities and Towns in India. Uni-GAUGE offers Insightful News and Blogs related to all Engineering streams. Mock Tests are also provided to enable students prepare for the Online Entrance Exam. 20 TH FEBRUARY 2018 Mock test made available online. Candidates should have passed second Pre-University Course (PUC) or 10+2 Or Higher Secondary or equivalent examination. Diploma students looking for admission to Engineering streams are eligible. Examination passed should be recognized by State / Central Government. Candidates appearing for the above examinations in the current academic year are also eligible to apply. The Candidates have to register themselves at www.unigauge.com. The candidates may access the How to Apply Document, general instructions and the explanation for filling the required fields through the link in the website www.unigauge.com. However, these instructions are reproduced as under. a) All the details asked for in Registration /Application form are Mandatory. c) An Email ID once used for Registration online cannot be used again. d) Details given at the time of registration cannot be edited later on in the application form. Please review all details entered at time of registration before CLICKING ON SUBMIT BUTTON and proceeding to application form. e) After successful registration, you will receive the User id and Password on your Mobile Number and E mail id which is unique & system generated. Log in with your unique USER ID and PASSWORD to complete the application process. Click on EDIT button (Right hand top corner) to be directed to Application Formf). Name of the Applicant:Enter your full Name (as it appears in your SSLC/10th Std Marks Card).In the case of a candidate who has changed his/ her name for any reason, the original proof of the same has to be produced at the time of admission. ?Date of Birth: DOB to be entered as per 10th /SSLC Marks card only. “School / College Photo ID” in original and Photocopy of the same (School / College Photo ID) attested by the principal of the institution last studied (2nd PUC/12th STD). 6.INSTRUCTIONS FOR FILLING THE ONLINE APPLICATION FORM Candidates are advised to go through the instructions carefully before filling up the online Application Form General Instructions for filling the Online Application Form. b) Ensure that Online Application Form is filled properly with all complete details. Click on “PREVIEW” button and re-verify all the particulars in application form before clicking on SUBMIT button. d) Multiple application forms from the same candidate will result in confusion leading to disqualification of the candidate. ERA Foundation is not responsible for any error that the candidate commits whilefilling the Online Application Form. Provisional Answer Keys, Final Answer Keys (post challenge verification) and Test Scores of the candidates will be made available under the individual login, www.unigauge.com as per the calendar of events. Clarifications, if any, should be sought within the dates stipulated. Subsequently the final result made available which will be binding on all candidates and no further claim would be entertained thereafter. (Please refer to the Calendar of Events for details). a) Applicant to login using his/ her user ID and password and fill the query in the challenge form provided online, clearly indicating the grievance and with all necessary enclosures. b) Clarification regarding provisional answer key should be submitted online in the format made available with a fee of Rs.500/ - (Rupees Five Hundred) per clarification to be paid online only. c) Only if the clarification sought is upheld, the money would be refunded in full after the Uni-GAUGE E - 2018 process is completed. d) Any request for clarification of provisional answer keys beyond the last date as stipulated in calendar of events will not be entertained. Note: Seeking clarification as above is only for provisional answer keys. Such clarifica tions are not entertained in respect of Final answer keys/Test Score and thereafter the Rank. final and binding on all. a) Test scores of Uni-GAUGE E 2018 will be made available to candidates on 29th May 2018 under applicant login on www.unigauge.com for all eligible candidates. b) The candidates are expected to apply to their desired Participating member University/institution in response to the notifications issued by the respective University/Institution along with the test scores. c)Universities shall seek the details of the candidates that are participating in their admission process for verification. Universities/Institutions on request being made by them. e)Candidates will have their score cards available www.unigauge.com as per the calendar of events. f)All candidates must note that any form of canvassing or influence exercised, attempted would result in permanent disqualification of the applicant without any further notice. a) Online Score Card will be available under Applicant’s login in the website www.unigauge.com from 29/05/2018 onwards. c) You have to apply separately to the participating university that you are interested in along with the downloaded Uni-GAUGE test scorecard and the prescribed documents mentioned in the participating university website. d)University will verify the test score card submitted by you with ERA Foundation. e)University will prepare a merit list of the applicants who have submitted applications to them and conduct admission process. Uni-GAUGE Member Universities and Institutes accepting Uni-GAUGE-E Scores for Undergraduate (UG) B.E/B.Tech Courses. M.S Ramaiah University of Applied Sciences, Bangalore, Karnataka. SCSVMV University, Kanchipuram, Tamil Nadu. Manav Rachna International University , Delhi. Saveetha University, Chennai, Tamil Nadu. Periyar Maniammai University, Thanjavur, Tamil Nadu. K L University, Vijayawada, Andhra Pradesh. Karpagam University, Coimbatore, Tamil Nadu. May I know, How to fill UNI GUAGE-E Application form? Candidates are required to visit the official website of UNI GUAGE-E in order to fill the UNI GUAGE-E Application form via online mode. UNI GUAGE-E Aspirant has to fill up all the credentials such as Name, email id and mobile number. The candidates need to upload the scanned images of photograph, unique identity number, candidate’s signature and father/guardian signature. Then the candidates need to make the payment of Rs 1600+ GST if they are registering for only UNI GUAGE-E. If the candidates want to register for both COMEDK AND UNI GAUGE-E they need to make the payment which costs Rs 2100+ GST. Payment has to be done via Credit Card/Debit Card /Net Banking. I want to know the UNI GUAGE-E Admission process? UNI GUAGE-E Admission process will be declared by the Member Participating Universities or Institutions depending on their policies. The admission process will be mainly based on the score obtained by the candidates in the UNI GUAGE-E exam. UNI GUAGE-E participating institutions will be having their own selection rounds for the admissions to the Undergraduate programs. Is there UNI GUAGE-E Application form correction process, I have made an error while filling the form? If the candidate has not clicked the “submit” button, they can edit the UNI GUAGE-E Application form n number of times. As there is no UNI GUAGE-E Application form correction process, the candidates should be careful at the time of UNI GUAGE-E Registration. There is an option of filling the new UNI GUAGE-E Application form where the candidate needs to provide alternate email id. Once the Application form Fee has paid, it cannot be refundable. In order to apply for both COMEDK UGET &UNI GAUGE- E Exam, How many exams do I have to appear? The candidates will be appearing for only one exam. Both COMEDK UGET &UNI GAUGE- E Exam will be held on the same day and session as a 1 combined exam i.e. on 13th May 2018. Initially, both the exams were been organized as 2 separate exams. COMEDK UGET was been held via offline mode entrance exam in the state of Karnataka. UNI GAUGE- E was been held as an online entrance exam across India. Now both COMEDK UGET &UNI GAUGE- E Exam being 1 combined exam. which all sections do we have in Uni- GAUGE- E Exam Pattern, I want to know the overall marks for the Uni- GAUGE- E? Uni- GAUGE exam will be held in online mode i.e. Computer based Test. Uni- GAUGE exam will have 3 sections such as: Physics, Chemistry and Mathematics. In Uni-GAUGE-E Exam pattern, The Total Number of questions is 180 (MCQs) consisting of 180 marks. Each section comprises of 60 marks. The duration of the Uni-GAUGE-E exam is 3 Hours. In Uni-GAUGE-E Exam pattern, for every right answer 1 mark will be given. There is no Negative marking system in Uni-GAUGE-E Exam.